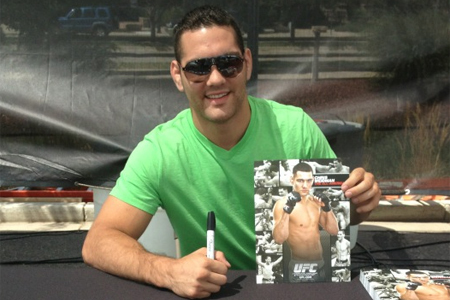 July 6, 2013: It’s a day Chris Weidman (pictured) will never forget. On the flipside, a day former UFC middleweight king Anderson Silva will never live down. Silva claims Weidman was able to shock the MMA world because his foot was positioned incorrectly. However, would the foot placement have even mattered if Silva wasn’t taunting and teasing Weidman for much of their fight? Silva dared “All-American” to hit him in the face, and Weidman obliged with a left hook that had the UFC’s most decorated champion unconscious on the canvas. “The Spider” was so dazed and confused following the strike that he tried to score a double-leg takedown on referee Herb Dean, who had already stopped the assault seconds earlier. Silva looks to reclaim his throne December 28 at UFC 168. The shootout marks the most anticipated rematch in MMA history, hence the $5 price hike to watch the show on pay-per-view.